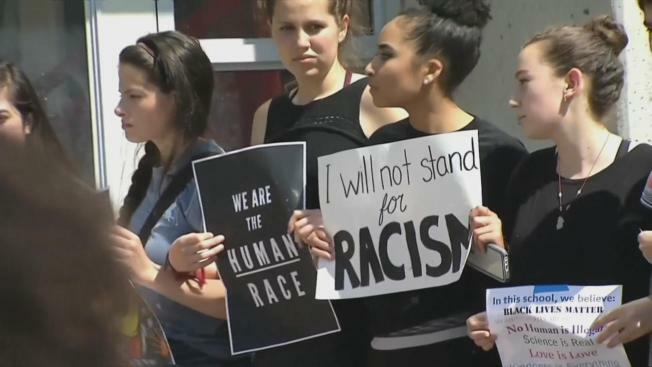 Albany High School students protest over racist Instagram posts. A federal judge has ordered the Albany Unified School District not to take any additional disciplinary action against four students over their responses to racist Instagram posts. District officials suspended the four after they left comments on the Instagram account or indicated they "liked" a post. U.S. District Judge James Donato on Friday issued a temporary restraining order blocking the district from imposing any additional discipline against the students. One of them was facing an expulsion hearing in June. Donato said the students' lawsuit challenging their suspensions raises serious First Amendment questions. The racist posts included nooses drawn around the necks of a black student and coach. The district has said it intends to defend itself. The students themselves have filed a lawsuit against the school district, accusing officials of infringing on their free speech rights.